Fantastic product and wonderful service. This is a fantastic product, fresh and spicy. I just love it and highly recommend obtaining this wonderful product from Al-Rashad books and gifts. Their range and service is top quality, with a fast delivery. Definately a 5 star rating for Al-Rashad Books and Gifts and Al-Rahab Superman 50ml Eau De Natural Perfume Spray. 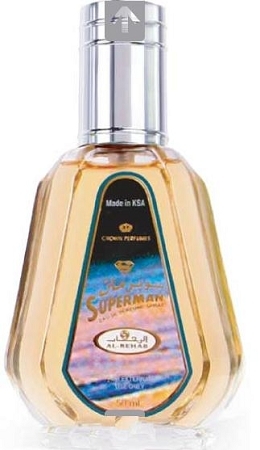 Everyone in my family likes Superman cologne/oil by Al-Rehab. A great price and a consistent seller makes this another winner. For sure we will be buying this again.